As you may have already gathered, I love decorating and creating things for holidays. Any holiday really. I was so disappointed that I forgot all about Groundhog Day yesterday. I completely missed out on decking my apartment in groundhogs! I bet my boyfriend would have loved that. Just wait until next year, sweetheart. I probably forgot about Groundhog Day because I’m already getting ready for Valentine’s Day with decorations and delicious treats. Initially for today’s post, I was planning to give Valentine’s Day cookies another try since I failed so hard at them last year. But I procrastinated over the weekend by watching the Puppy Bowl and Super Bowl and had one of those days at work where things never end and I forget to eat lunch. So I decided that was too much effort and will be tabled until next weekend (if I’m ambitious) or next year. Lucky for you that means I have a super easy recipe today, which really only requires one difficult task – waiting. If you ask Luna or Tom Petty, waiting is the worst. Don’t listen to them because with this kind of waiting you can go off to put your feet up and cuddle with your dog under a blanket while an epic wind storm swirls around outside. And if it isn’t as windy near you as it is in Northern Virginia today, then maybe you can even venture outside. 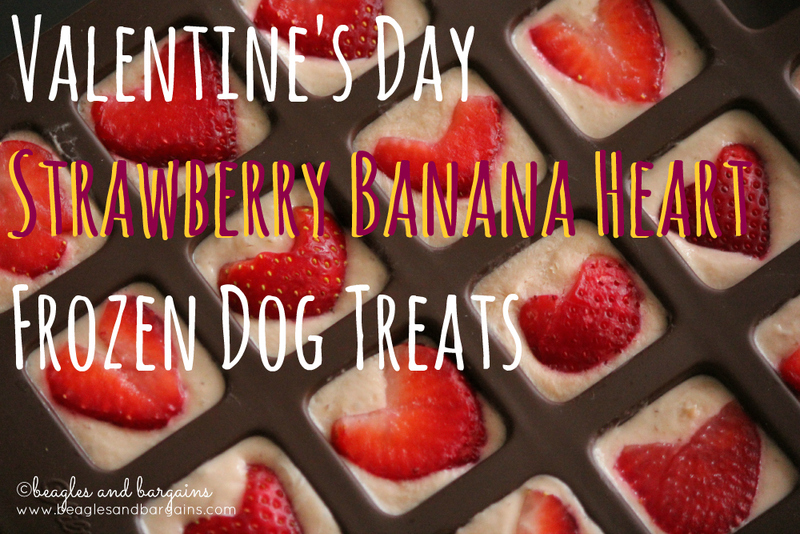 Today’s recipe is a Strawberry Banana Frozen Dog Treat with a heart shape inside for Valentine’s Day! Peel and puree bananas with an immersion blender. If you don't have an immersion blender, mashing the bananas works too. Mix yogurt with bananas to thin out the liquid. You can add as much yogurt as you like. 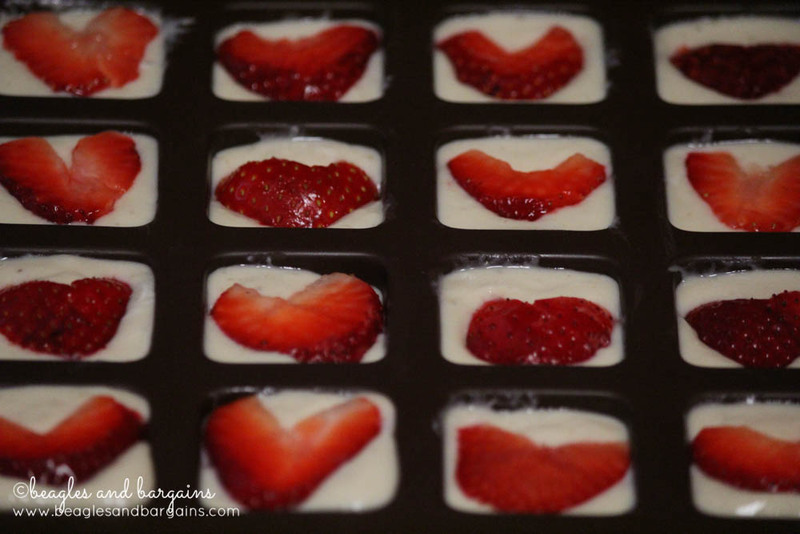 Pour banana and yogurt mixture into silicone molds or ice cube trays. Leave some room for the strawberries. Cut the strawberry tops off in a V-shape. Strawberries should now resemble hearts. 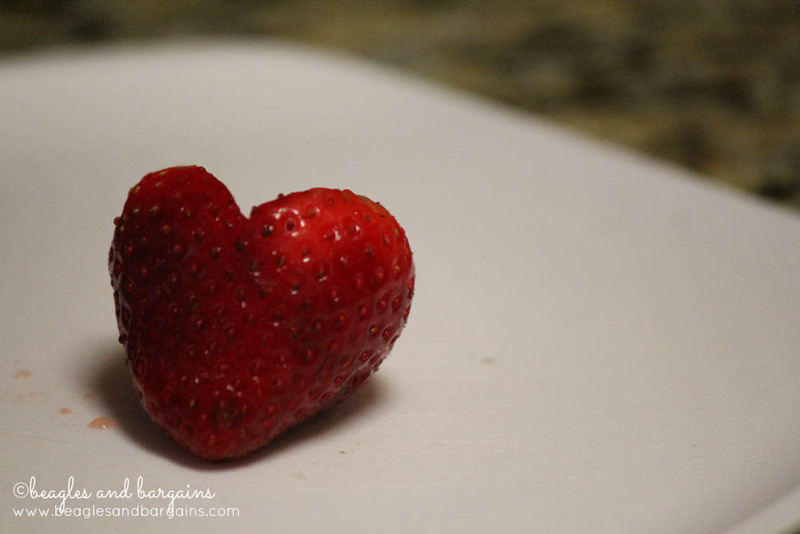 Slice each strawberry into 4-6 pieces, so that each slice still resembles a heart. 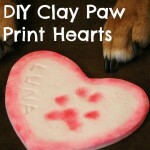 You may need to trim some of the slices so that they can fit in the mold or to appear more heart shaped. Place a strawberry slice on top of each section of banana and yogurt mixture. Press the strawberry into the mixture slightly. 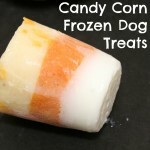 Freeze for 2-3 hours or until frozen and serve. The silicone mold I used was the Wilton Silicone Brownie Squares Baking Mold (affiliate link), which is available at Amazon. I found mine at Michael’s and used one of the 40% off coupons to bring it down to only $6. If you are too impatient to freeze these, I won’t blame you because these are in fact delicious. So delicious that you may be fighting your dog for some. But don’t do that. 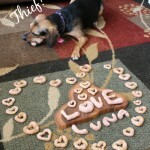 They are heart treats after all, so share the love! 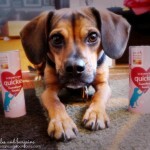 Have you seen our DIY Valentine’s Day Dog Silhouette Garland? It would go perfectly with these delicious treats! Do you have any special Valentine’s Day treats planned? Disclaimer: Affiliate links are used in this post and I may receive a commission if you click and/or purchase from the link to help support this blog. Do not worry, these links do not affect the price of products. Today we are participating in a delicious blog hop called Tasty Tuesday! It is hosted by our friends Sugar the Golden Retriever and Kol’s Notes. 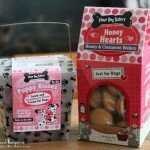 Hop along and find some tasty treats for your pup!